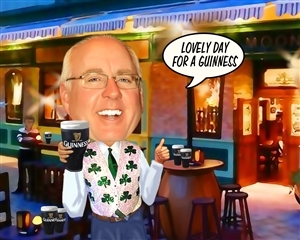 See all 0 examples in "All"
There's nothing better than stopping for a drink at your favorite Irish Pub after a long day at the office. This cariature makes a great gift for all of you out there who truly appreciate a great Guinness paired with some authentic Irish Pub cuisine! Perfect gift for an Irishman!